Also in Westminster Abbey, King Edward the Confessor’s coffin was moved to a new shrine and opened by a curious Henry II in 1163. Edward was discovered with his long white beard intact and still dressed in cloth of gold with an embroidered mitre on his head and purple shoes on his feet. The pilgrim’s ring Edward wore was taken by Henry II as a relic and the cloth of gold turned into ‘three splendid copes’ (long cloaks). The tomb of King Richard II was opened in 1871 during restoration work and the skeleton was found to be nearly perfect. Several ‘relics’ were taken from the tomb – and were later found in a cigarette box in the basement of London’s National Portrait Gallery. The contents of the box, dated 31 August 1871, included fragments of wood from the coffin, as well as some fabric, and leather from one of the royal gloves. 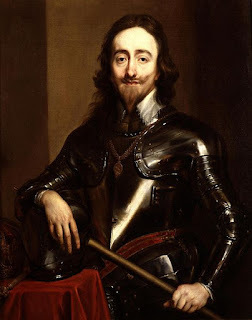 “Tuesday 23 February 1669 followed my wife and the girls I now took them to Westminster Abbey, and there did show them all the tombs very finely, having one with us alone, there being other company this day to see the tombs, it being Shrove Tuesday; and here we did see, by particular favour, the body of Queen Katherine of Valois; and I had the upper part of her body in my hands, and I did kiss her mouth, reflecting upon it that I did kiss a Queen. 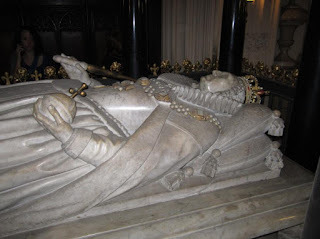 During research for my book on Lady Eleanor Cobham, I discovered the disturbing tale of what happened to the body of her husband, Duke Humphrey of Gloucester. His tomb at the Abbey Church of St Alban was regularly visited by women who believed the embalming fluid used had ‘magical’ properties to cure wrinkles. The sexton made a small fortune selling thimbles of the ‘potion’ and physicians even took away samples for experimentation. Eventually the liquid ran out and visitors took Humphrey’s nails and hair until only a few small bones remained. In 1784 the Churchwardens of St Mary's in Bury St Edmund's removed the altar monument of King Henry VII’s daughter Mary Tudor, the French Queen. Quite unnecessarily they opened her coffin and found her hair was ‘perfectly sound’ and of considerable length, some two feet long, and of a ‘beauteous golden colour’. Finally, I wonder what Henry VIII would have to say about sharing his vault beneath St. George's Chapel in Windsor with Jane Seymour, a stillborn child of Queen Anne and the body of the executed Charles I? The tomb was uncovered in the presence of the Prince Regent in 1813 and several relics of Charles I were removed, including a piece of vertebrae, a piece of his beard and one tooth. The Prince’s physician, Sir Henry Halford noted that ‘...the hair was thick at the back part of the head, and, in appearance, nearly black. A portion of it, which has since been cleaned and dried, is of a beautiful dark brown colour. That of the beard was a redder brown. On the back part of the head it was more than an inch in length, and had probably been cut so short for the convenience of the executioner, or perhaps by the piety of friends soon after death, in order to furnish memorials of the unhappy king.’ Sir Henry Halford was later heard to be passing around King Charles’ vertebrae at dinner parties to the amusement of his guests. Disturbing, indeed. No wonder the current queen is so hesitant to allow any access to remains for DNA testing and the like. I don't think Elizabeth of York would be too keen to have James I at her side forever! I don't see why not, considering James I was a direct descendant of Henry VII and Elizabeth of York. Actually, the situation with Elizabeth I is the reverse of this — her coffin is on top of her half-sister Mary's, not the other way round. (Which makes sense, as she was placed in the vault last). This is from the appendix on the royal burials in the Henry VII Chapel to be found in Dean Stanley's 'Memorials of Westminster Abbey' a priceless source on the whole subject. Yes I found the reference and can see the confusion. as Dean Stanley originally says 'the stately coffin of Elizabeth rests on the coffin of Mary" then goes on to say in the appendix entitled "The Royal Vaults" "It was instantly evident that it enclosed two coffins, and two only, and it could not be doubted that these contained Elizabeth and her sister Mary. The upper one, larger and more distinctly shaped in the form of the body, like that of Mary Queen of Scots, rested on the other. There was no disorder or decay, except that the centering wood had fallen over the head of Elizabeth's coffin, and that the wood case had crumbled away at the sides, and had drawn away part of the decaying lid. No coffin-plate could be discovered, but fortunately the dim light fell on a fragment of the lid slightly carved. This led to a further search, and the original inscription was discovered. There was the Tudor badge, a full double rose deeply, but simply incised in outline on the middle of the cover, -- on each side the august initials E.R., and below, the memorable date 1603."